After my superlative experience with the pork ribs at Pappy's smokehouse, I couldn't wait to try Bogart's, which my friend Dana told me was even better than Pappys. I went for an early lunch with Dana and his friend, Adam. Bogart's is right next to the Soulard farmers market - a large covered market with lots of vendors selling fruits, vegetables, meats and other goods. We went for a stroll through the market before we had our meal. 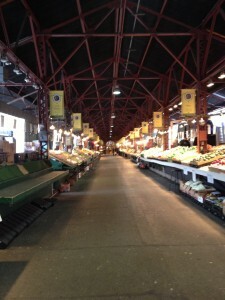 The prices were super affordable and I could imagine coming here for my produce if I lived in St. Louis. Bogart's is a smaller establishment than Pappy's. We were the first ones in the door and we ordered a full rack of ribs, and a plate with smoked prime rib and pastrami. Each of the entrées came with two sides, so we got the fire and ice pickles, barbecue baked beans, barbecue pork rinds, and deviled potato salad. The ribs were fall off the bone tender, deeply smoky and glazed with a sweet BBQ sauce. 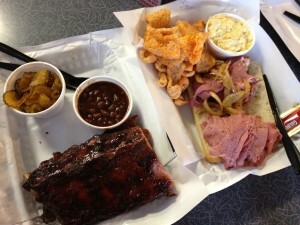 Although the ribs were very good, I still prefer the ones that Pappy's but I can see why Dana prefers these. It is a personal preference, plenty of people like fall off the bone tender however I like my meat to have some chew - I want it to put up a little bit of a fight. I also thought the sauce was a touch too sweet. Bogart's does win in terms of sides, especially the fire and ice pickles. They are as outstanding as a pickle slice could be: sweet, crisp, crunchy with a kick of heat at the end. It was a flavor explosion. I enjoyed the deviled potato salad as well as the barbecued pork rinds. I thought the baked beans were too sweet (they are probably using the same sauce as the ribs). There is no loser in the fight between Pappy's and Bogart's, and the winner is the diner. Supposedly, Pi is Obama's favorite pizza. They have an outpost in Washington DC. I like that they offer Chicago style deep dish pizza as well as thin crust. 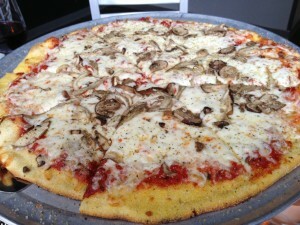 We went there for a meatless Friday meal and started with a veggie bruschetta and a thin crust wild mushroom pizza. The pizza was somewhat expensive, $18 for a 16 inch pie. The veggie bruschetta was from the happy hour menu so that was only $4. I thought the bruschetta was quite good, a plethora of roasted vegetables atop crostini and ricotta. I found the pizza to be adequate. The crust was too cornmealy for my taste. Our server was young and enthusiastic and my cocktail, also on the happy hour specials, was delicious. Marc and I had an early Saturday morning breakfast at Crepes, sister restaurant to Scapes. We shared a savory crepe and a croque Madame. The beef crêpe had shaved prime rib, sautéed peppers and onions, mushrooms and melted mozzarella. It tasted like a Philly cheesesteak stuffed into a French crêpe. I thought that it was delicious. The croque madame was not a croque madame; however it was a most excellent breakfast sandwich. It was a large mound of shaved ham, melted Swiss, and an easy over egg on an flaky, buttery croissant. The restaurant is casual; you order at the counter and you find a table and they will bring you your food. While we were walking towards an empty table, Marc noticed potato wedges on another diners plate and said to me "hey, did you want some potatoes?" Of course, I wanted the potatoes. He ran back and in a moment of indecision when asked wedges or fries, he answered both. I'm glad he noticed them as the wedges were the thick cut fries I've been wanting. 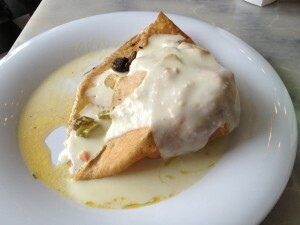 Crepes is a fabulous, casual place for a quick breakfast in an adorable neighborhood. The table next to us had blueberry pancakes topped with lemon curd but also look delicious. It is reasonably priced and the service is efficient. Around the corner from Crepes is a cupcake bakery called The Cup. The selection is not overwhelming, like at Crumbs, but they do have a variety of interesting flavors. Marc is a "cupcake traditionalist" and decided to have a yellow cake with chocolate buttercream frosting. 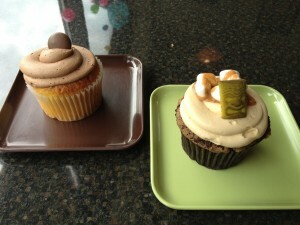 I went with a specialty cupcake – Mayan Mocha – which was a spiced chocolate cake with a caramel buttercream frosting. I am pleased to report that the cake was moist and tender and my buttercream frosting was especially delicious. The cupcakes are not cheap, but $3 a pop seems to be the going rate these days.